I'm sure you've already had your fill of Thanksgiving leftovers sandwiches and soups, but have you had Thanksgiving leftovers pizza yet? No, there's no cranberry sauce or brown gravy on it. That would be weird. But there is roasted butternut squash, leftover turkey, sauteed apples and blue cheese. Since Jeff said we'll be making this again in December and January, I thought it would be good idea to have another name besides "Thanksgiving Leftovers Pizza." 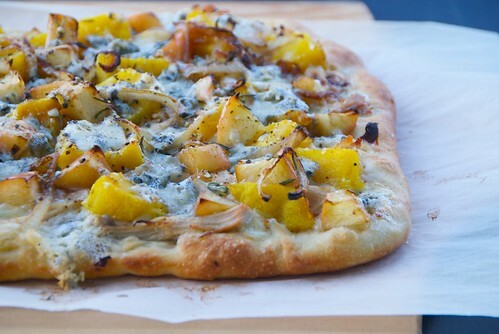 So feel free to call it Roasted Butternut Squash, Turkey and Apple Pizza with Blue Cheese. I have to remember this one for my leftovers next year. I especially like the combination with the blue cheese. Wonderful! words cannot describe how much i love pizza and Thanksgiving dinner...combine the two and i might spontaneously combust. seriously. This sounds like it's totally worth roasting a HUGE turkey for. Just so that maybe you WILL have enough leftovers until December. Or April. Great recipe! I'm going to include in my weekly "favorites" on my blog! What I love about leftover pizzas is that it's very crispy when you microwave it. :D Perfect breakfast all the time! That looks and sounds delicious! Sadly, I'm out of turkey (finally) but this may just be worth cooking up some more! Brilliant! I love the idea of adding blue cheese and apples. I wouldn't have thought of it, but I'm definately going to try it! Thanks for the creative recipe! We didn't have Thanksgiving in South Africa, but this is tempting enough for me to start a new holiday here!